The Association By-laws explain how our organization was established and is governed. The original Covenants and Restrictions were established concurrently with the early development of Verona Hills. These Covenants and Restrictions were made applicable to subsequent development phases by separate recorded instruments. They are intended to promote and protect property values by restricting the use of properties and to ensure improvements are built to certain standards that enhance the attractiveness of the residential community. The Declaration document establishes the Association, outlines its duties, provides for its governance, provides for special assessments and the means to collect such assessments. The policy for Delinquent Assessment has been added for your review. 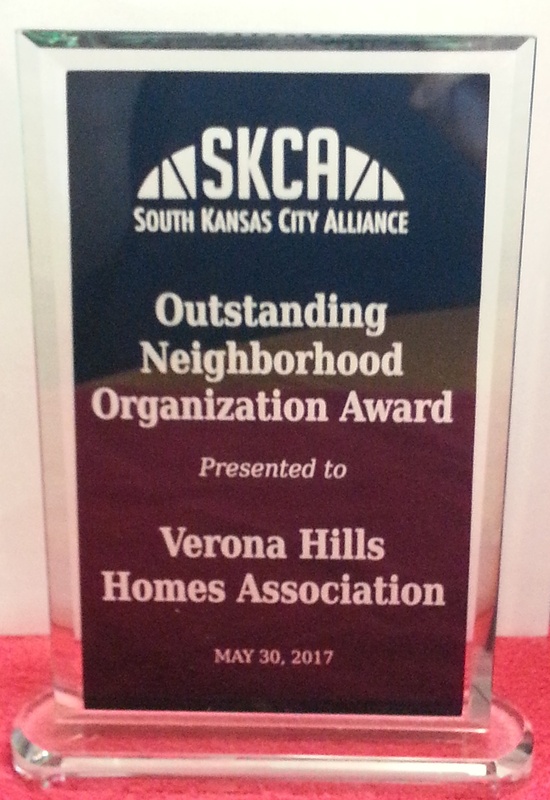 We are pleased to announce that the South Kansas City Alliance honored your Verona Hills Homes Association Board with the SKCA Outstanding Neighborhood Organization Award. We were presented with a beautiful plaque (image attached) during a breakfast at Avila University on May 30, 2017. This award is recognition for the present Board but it also honors former Board members and the many volunteers who have generously assisted with various projects and activities over the years. Indirectly, it recognizes the residents of Verona Hills and their pride in our community. Thanks for making Verona Hills a great place to live!! The new service is called Titan Protection and Consulting. They started October 1, 2014. All employees will be clearly identified by the Titan vehicle and Titan uniforms. Residents will be notified at the annual meeting this month and Titan will be present and give a short presentation. We are not allowing the residents to contact Titan directly. Obviously if there is a problem, the first call should be to the police department. If there are ongoing issues and concerns, any resident may forward those to Ross Nigro or any other board member and he will direct Titan to investigate, monitor or follow up on the issue. We are not publishing the times of the rounds because then the wrong people would know when they are in our neighborhood. We will have daily patrols throughout the neighborhood. They are armed with a gun, as well as a baton and pepper spray. They will check houses out if they see a problem and notify a home owner. For the latest fiscal year-end statement, open this link.